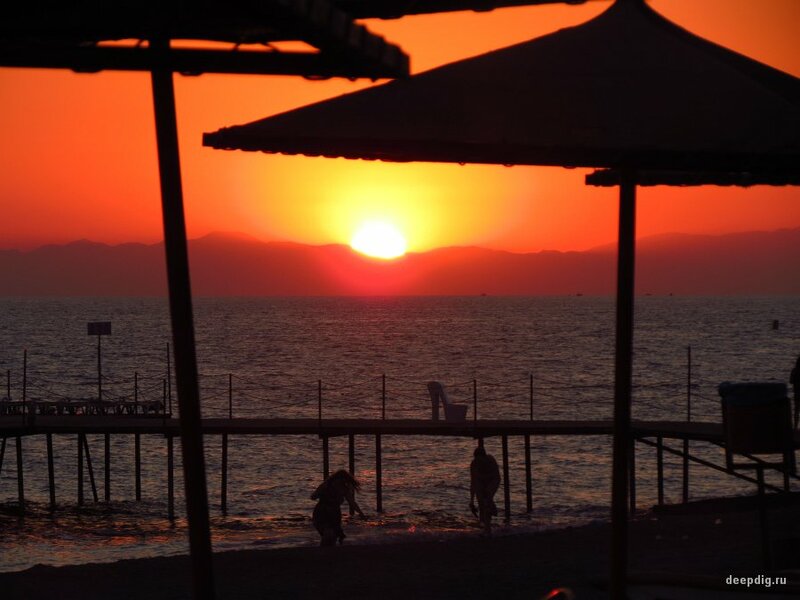 Turkey - a country of sun, sea and underground cities. I welcome you, lovers of all underground and unusual! This report will be very brief and informative because, unfortunately, there is no time to describe all events in detail. So, let's begin. 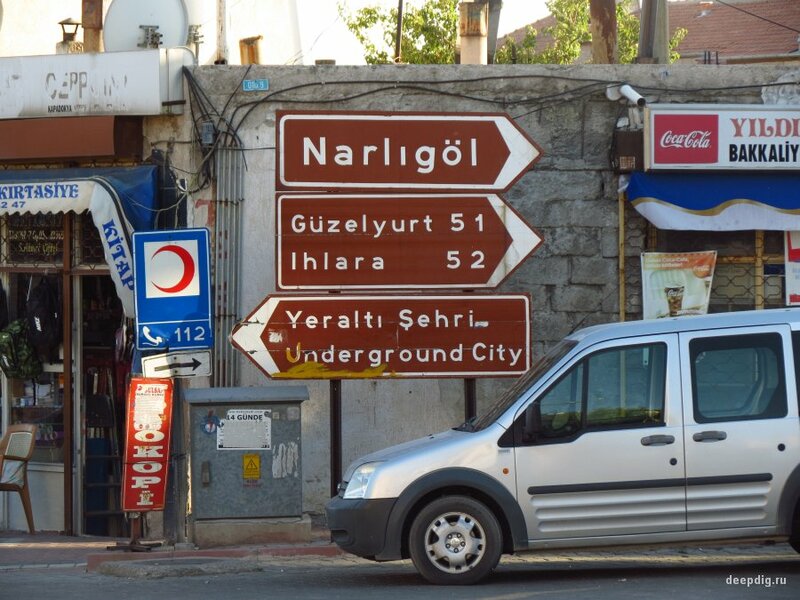 This fall, our DEEPDIG club has expanded its geographic of “groundings” through Turkey . 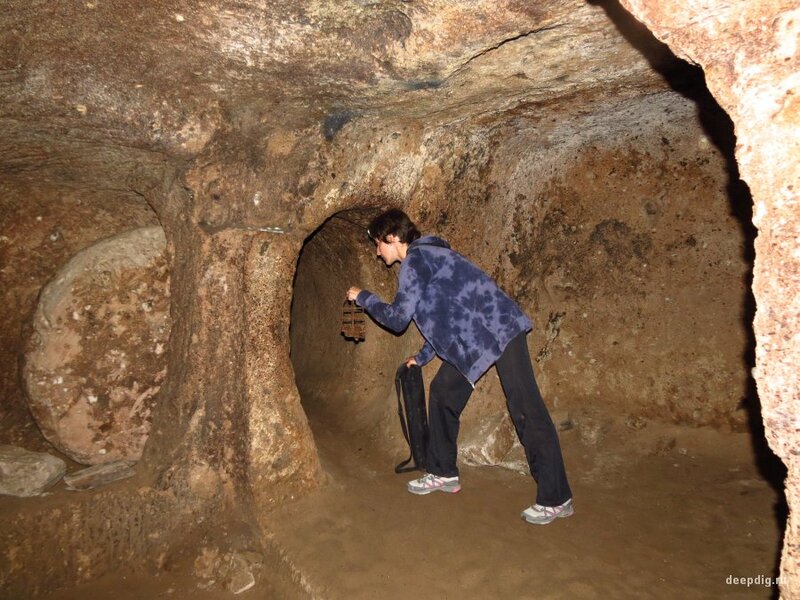 And the first object that will be described there is Damlatas cave in Alanya ( Antalya coast) .The cave, as usual, was open by chance in 1948 during the development of the quarry for the construction of a local port. 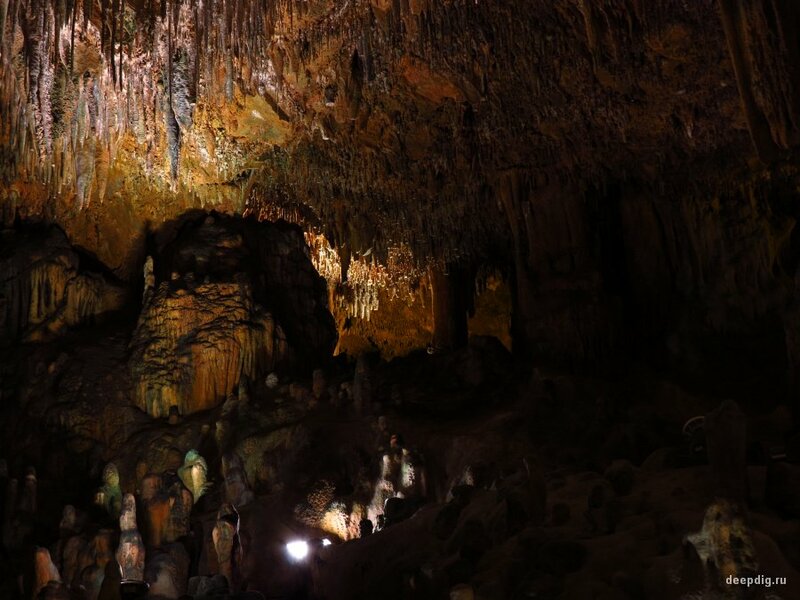 It is distinguished by a huge number of stalactites and stalagmites, there are also vary beautiful stalagnates somewhere. 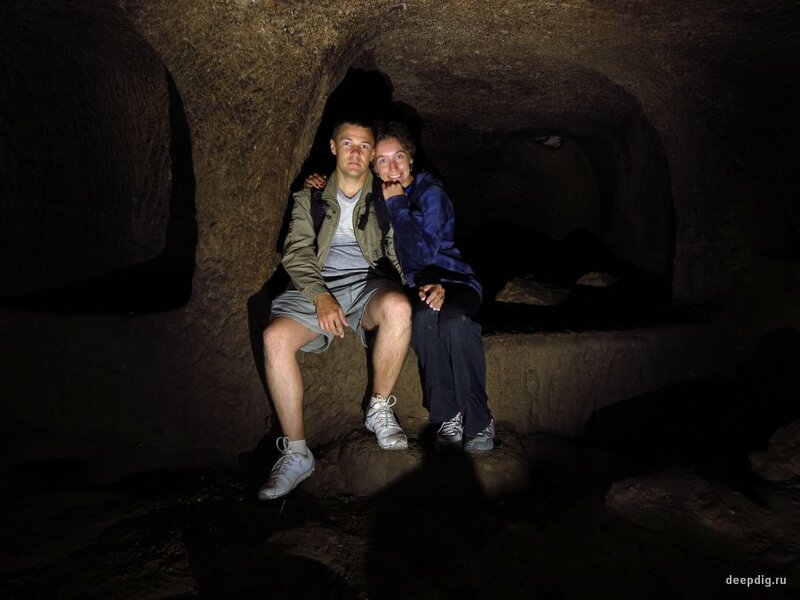 The cave is equipped for visitors, has a back light. There are only two storeys. Both have benches. This is made to ensure that people with asthma and other respiratory diseases could comfortably stay there for a long time. 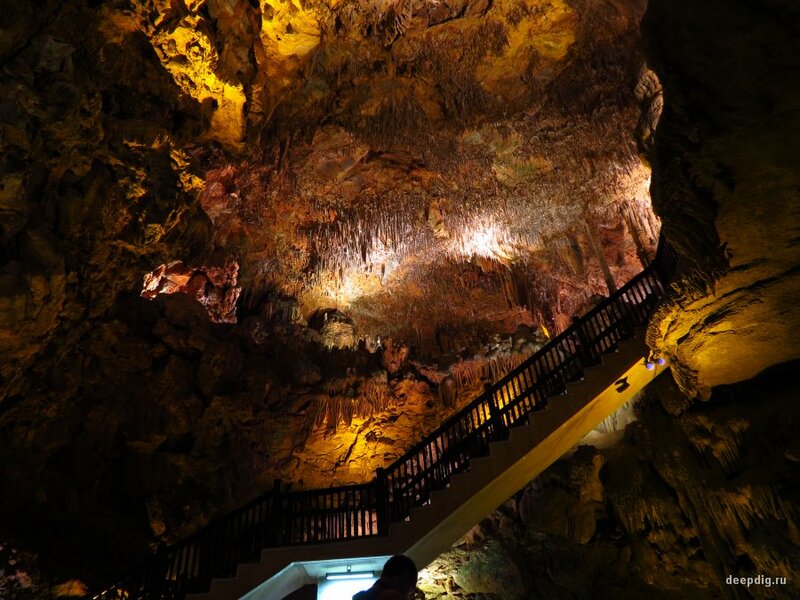 The microclimate of the cave is very health-giving: it is warm all the year round, humidity is 98%, the air contains large amounts of carbon dioxide and, in addition, as the cave is in communication with the surface almost at the coast, it is saturated with salts. 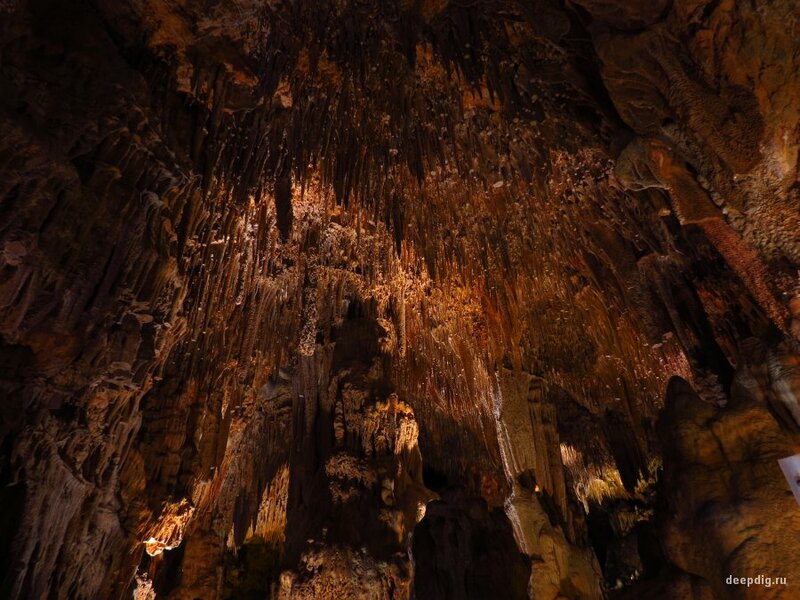 By the way, the name "Damlatas" may be translated from Turkish roughly as "water dripping from stalactites". 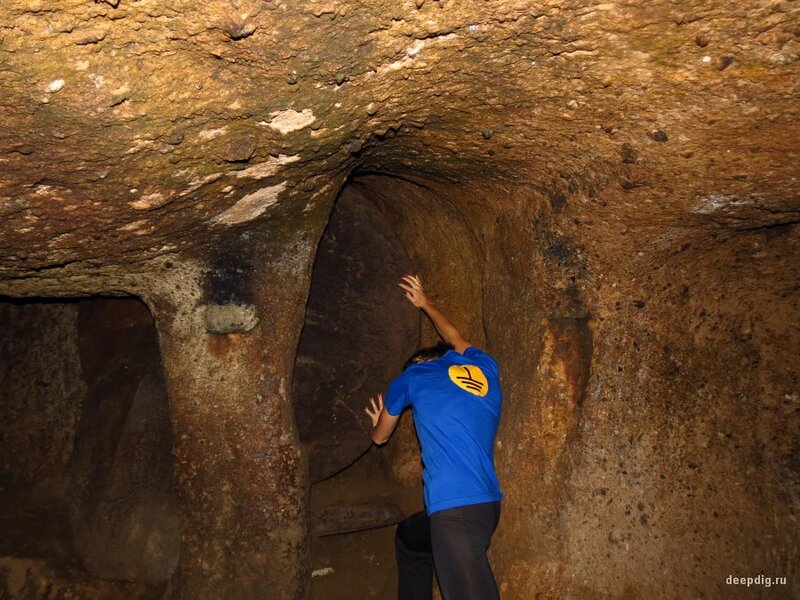 In conclusion, we can say that it is rather hard to stay in this cave for long for want of habit - because of the humidity it is difficult to breathe. I recommend to solo travelers to come to this place in the evening, closer to the end of a working day, when the main thread of buses subsides. 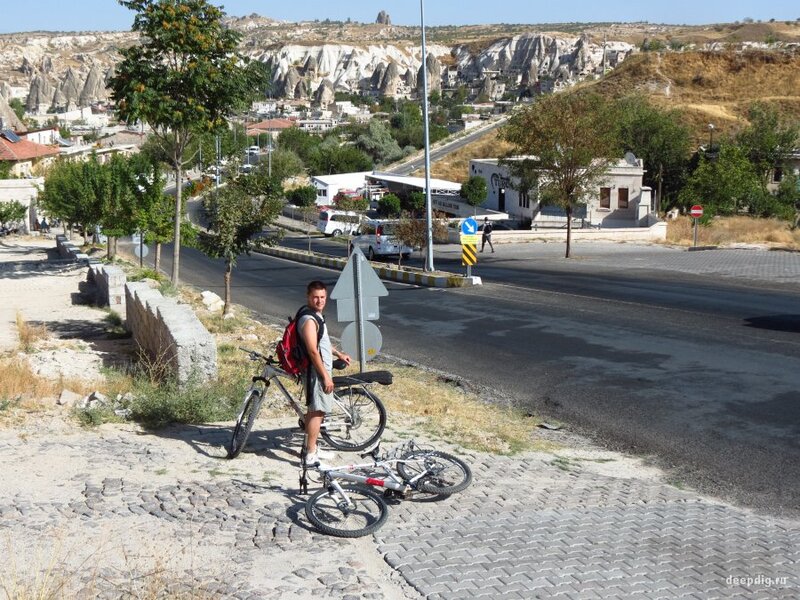 Then our route ran to the ancient, exciting and unforgettable Cappadocia . 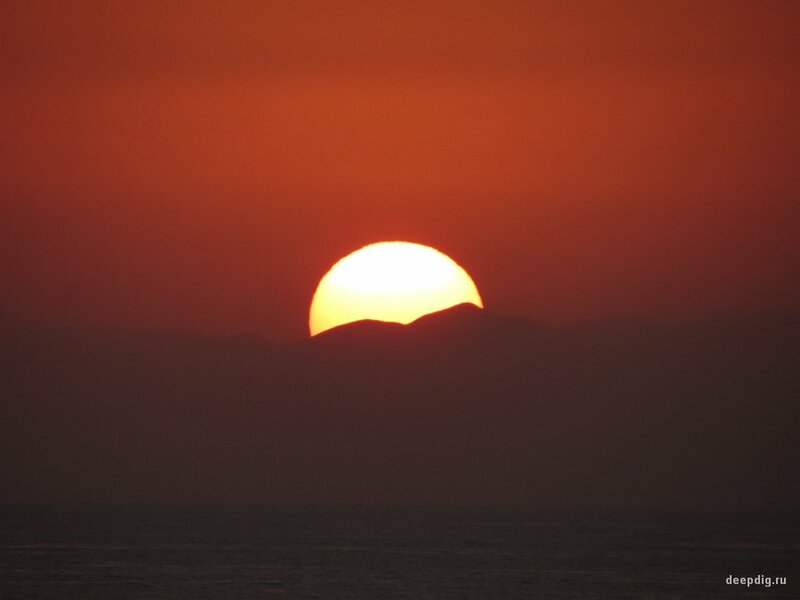 As it's known, space, disturbing imagination landscapes of this region are due to the emergence of a number of volcanic eruptions which occurred about 10 million years ago. What we can see at present - is the result of weathering and erosion of the soft volcanic tuff. Actually, the tuff deserves to say a few words about it. It is an igneous rock that is soft, has a wide range of colors and excellent insulating properties. This tuff can be easily handled with a saw and an ax. (Before the advent of iron tools people even managed to use obsidian for these purposes). 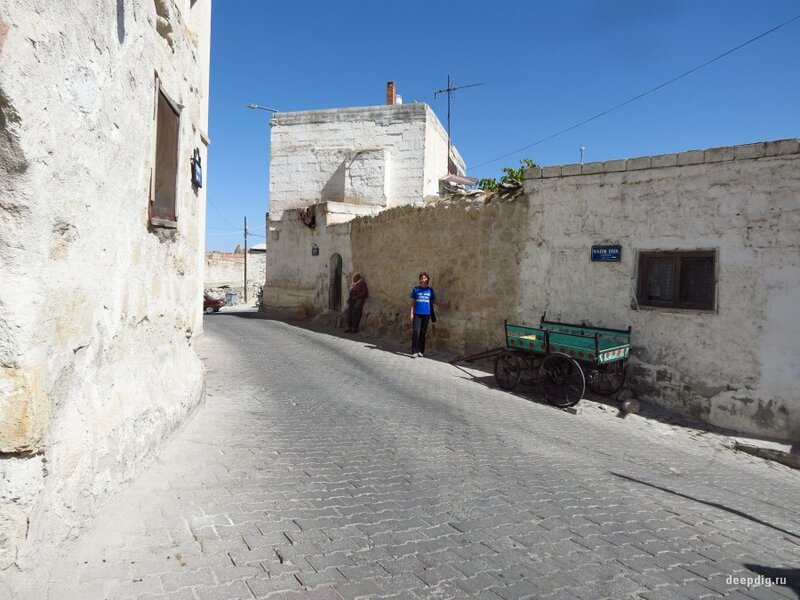 Since ancient times Cappadocia region had been situated at the crossroads of trade routes from the East to the West, being a titbit for all the major empires, but flat and quite deserted place could not protect the indigenous population from attacks. The region was under the rule of the Hittites, Persians, Romans, Turks. 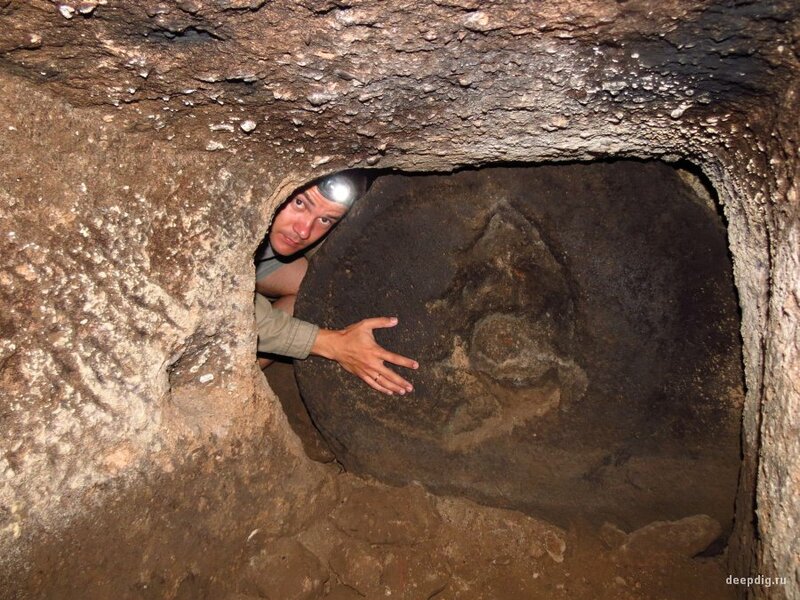 Thus, it is clear that absolutely everyone dug something in Cappadocia . 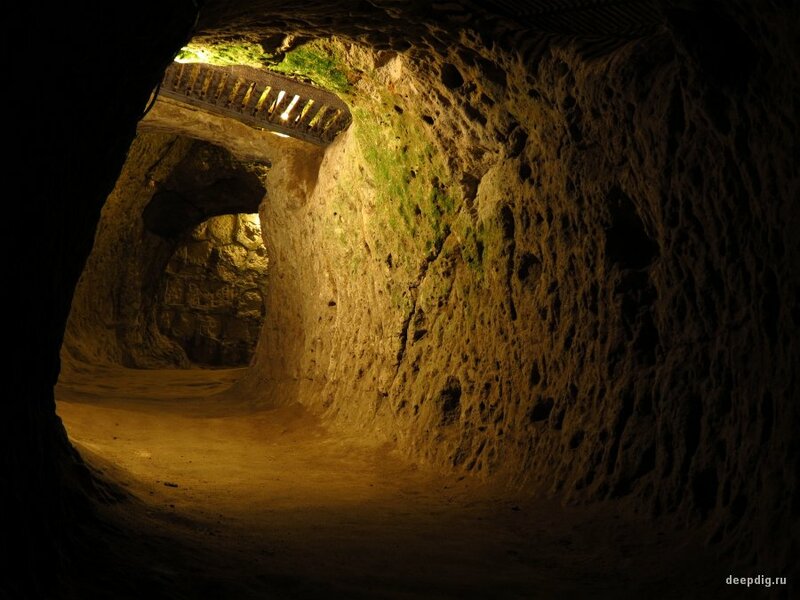 The history of the construction of underground dwellings and cities there dates back long before our era. 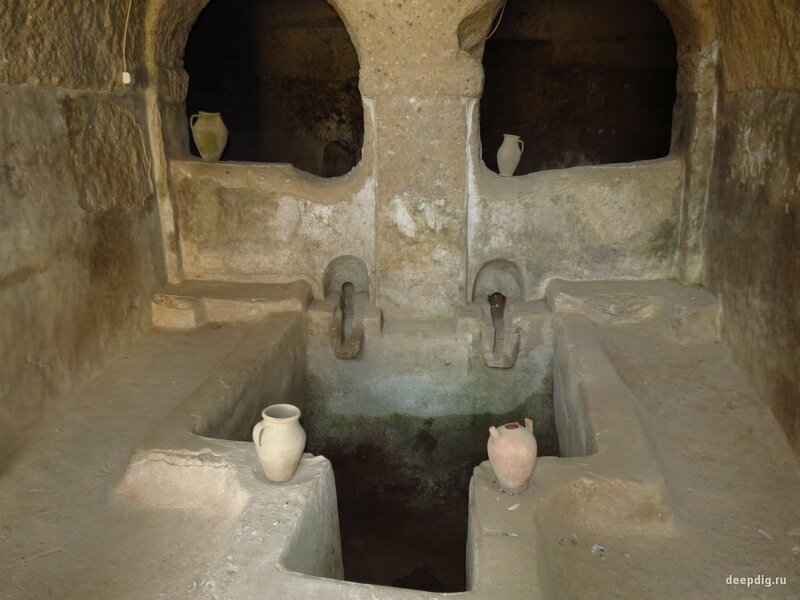 In the 4th century AD, as early Christians arrived in Cappadocia , and filled still lifeless earthen pyramids with secluded monastic cells, churches and impregnable monasteries. However, the most interesting is that the underground construction doesn't stop until now: the local residents still dig, if necessary, the underground extensions to their homes. A good example of this - a cave hotel in which we stayed. The owner told us that his family used to live here in a small house dug into the rock, much later he expanded it and turned into one of the top luxury hotels in Goreme. 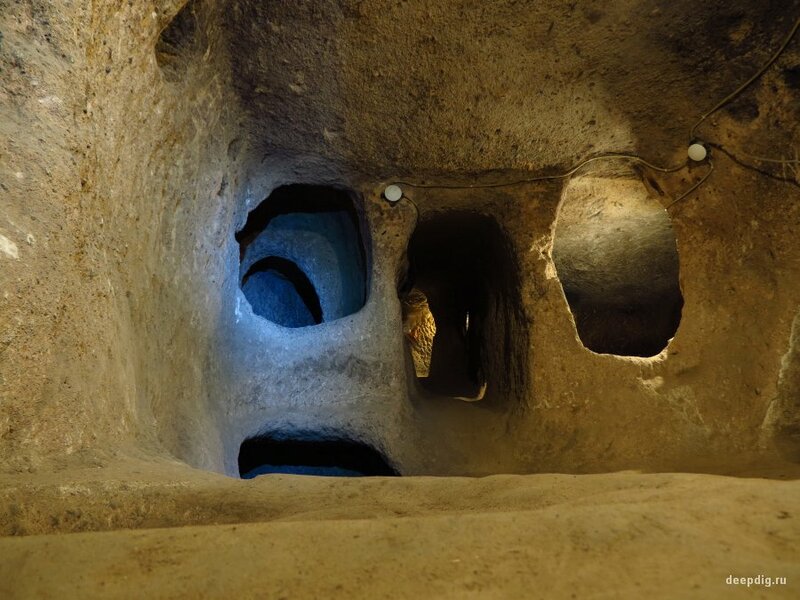 Derinkuyu Underground city. This is one of the most frequently visited tourist destinations in Cappadocia . 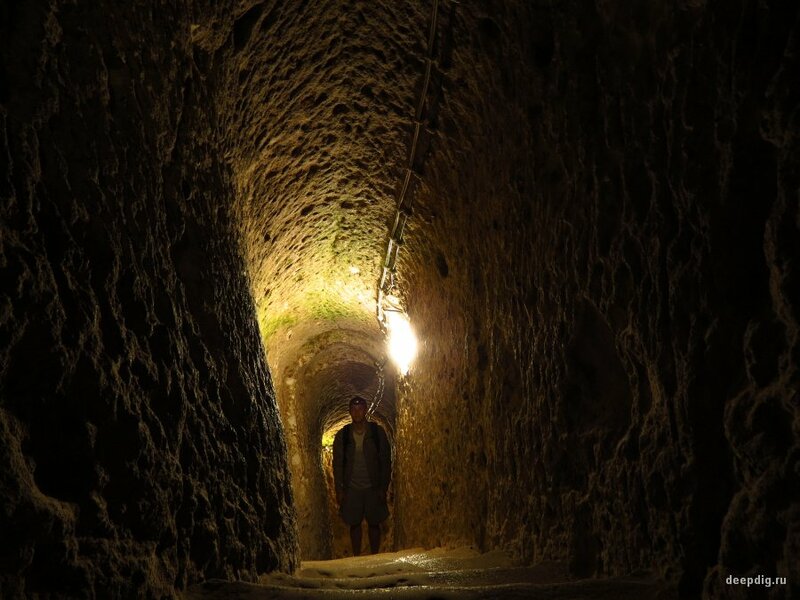 It is also the deepest of the 200 found underground cities in the area for today: its depth is 85 meters including the depth of the well on the lowest floor (8 floors are available for visiting). 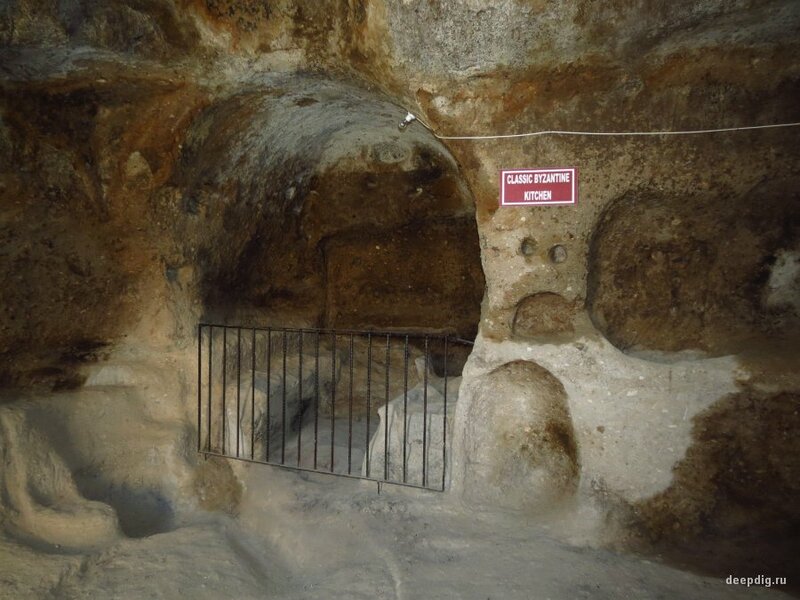 There is information that, in fact, Derinkuyu underground city is even deeper and has more floors, but to test such a hypothesis in a foreign country is not possible. From that we checked ourselves one thing is clear – the 8 storey of the accessible city part has no additional closed passages. 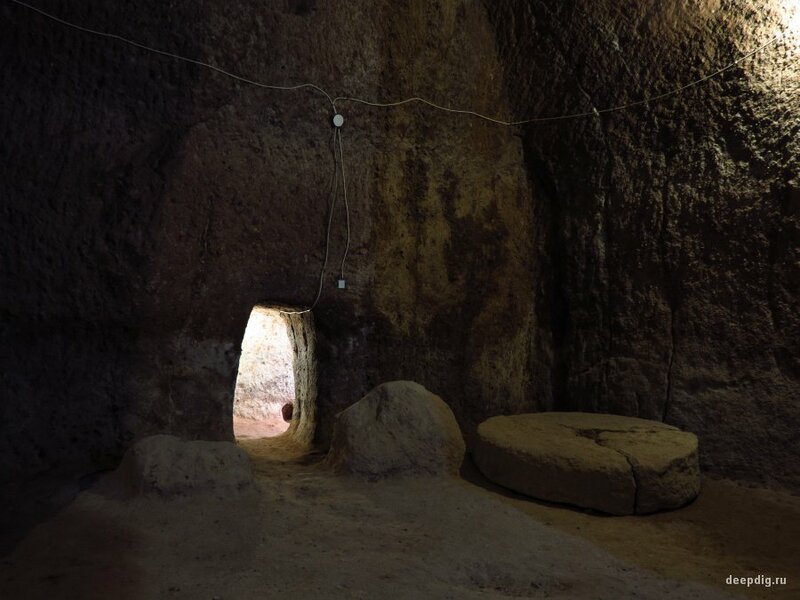 But after talking with locals we learned that half of the basements of houses in the village are connected to this underground city. 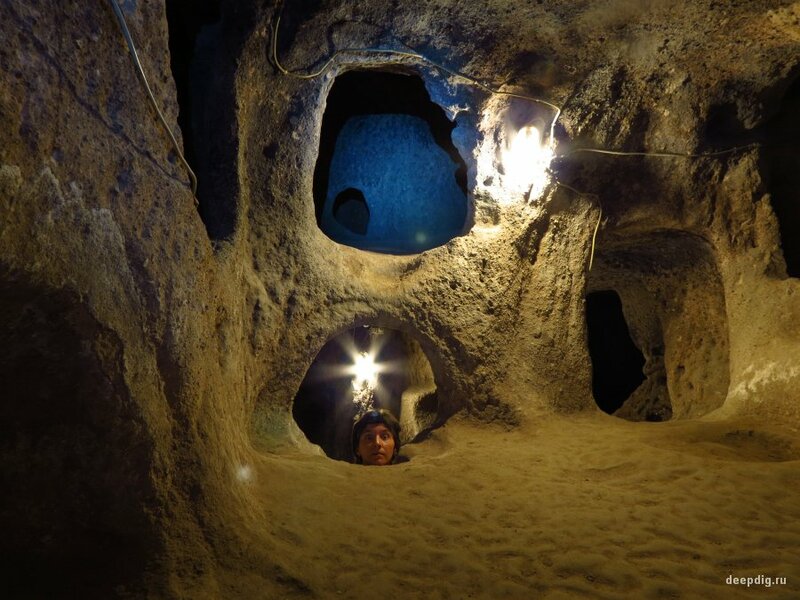 Slopes are mostly filled up or closed by hosts themselves, small underground rooms are often converted into warehouses and cellars. In addition, inspecting and photographing the floors, we saw a few low and narrow passages closed by shut bars. 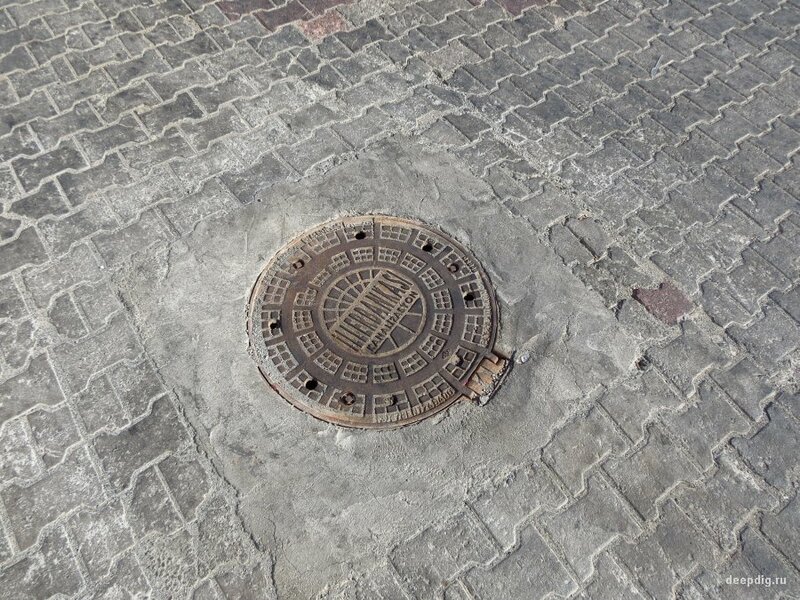 They may lead to ventilation shafts or to another part of the town. Who knows?.. Thus, it can be assumed with a probability of 50% that the city of Derinkuyu really has much more floors. 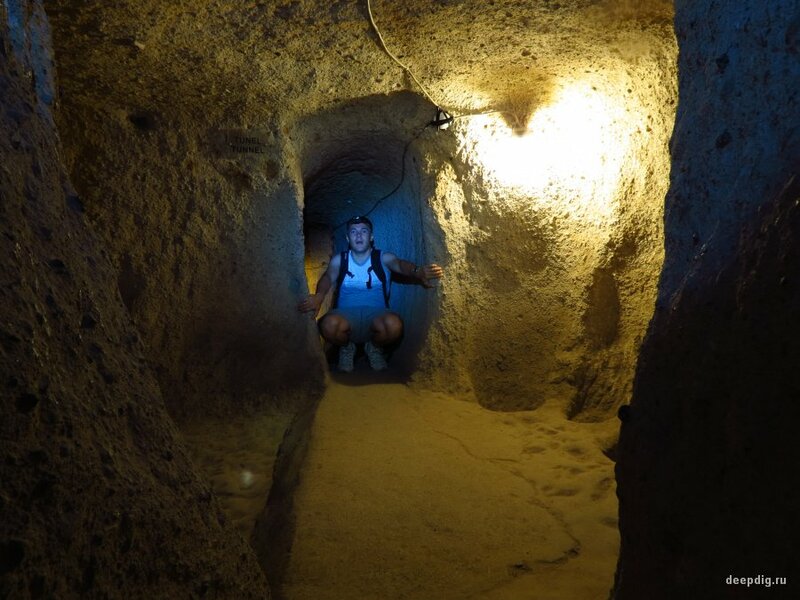 Now it's time to describe the underground city more at length. It has an incredibly beautiful and impressive structure. 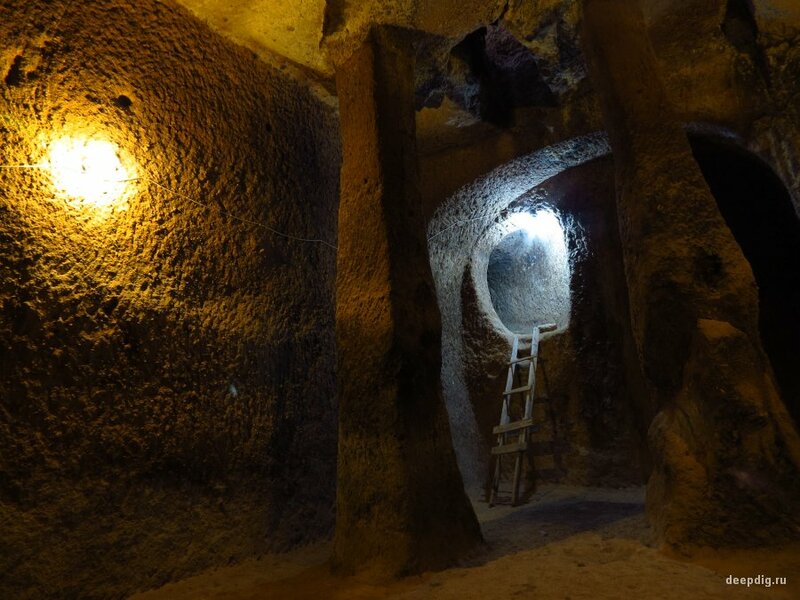 The ancient builders of Cappadocia originally planned it not as a place to wait out the danger of a couple of days but as a real underground fortress with stalls for livestock, cellars, wineries, wells, ventilation shafts, living rooms, temporary cemeteries, churches and even schools. 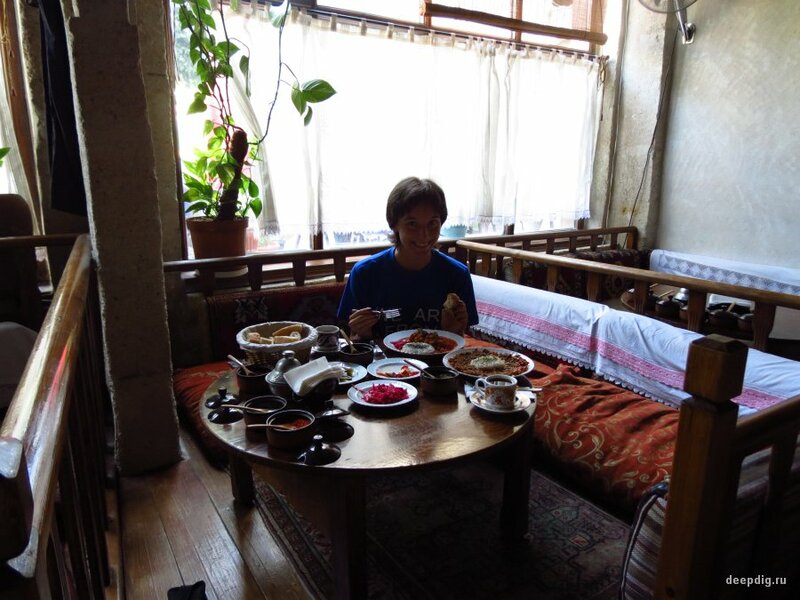 In such a city the whole village could be accommodated a couple of months. 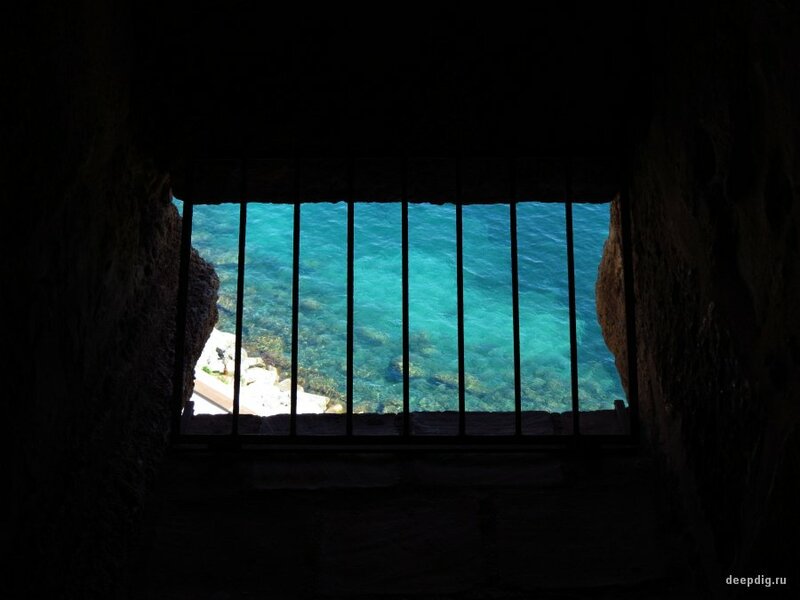 To protect people against a danger from the surface all passages are equipped with circular stone doors which allow to separate one storey from another; with traps; with false wells. 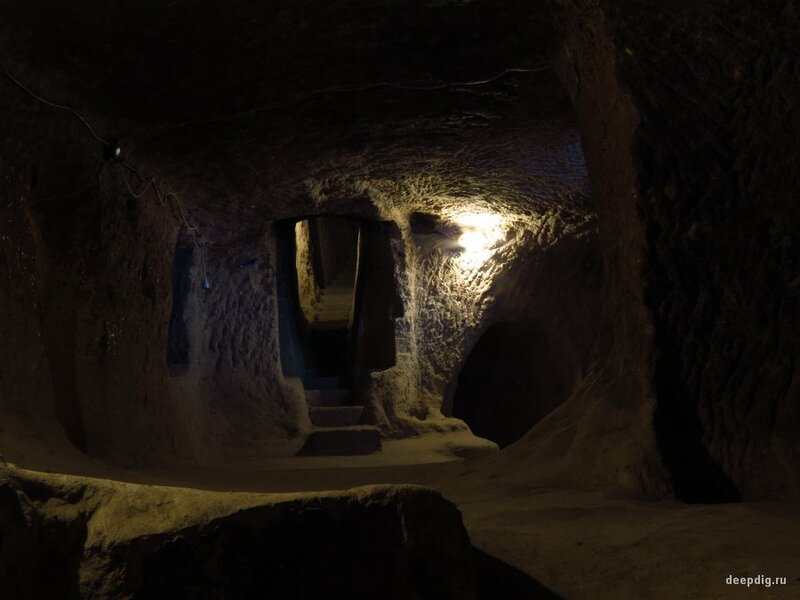 During the investigation we realized that Derinkuyu underground city has a vertically oriented configuration: each floor space is not too much, but there are a lot of stories and a lot of entries from the surface which led once to different sections of the underground shelter. 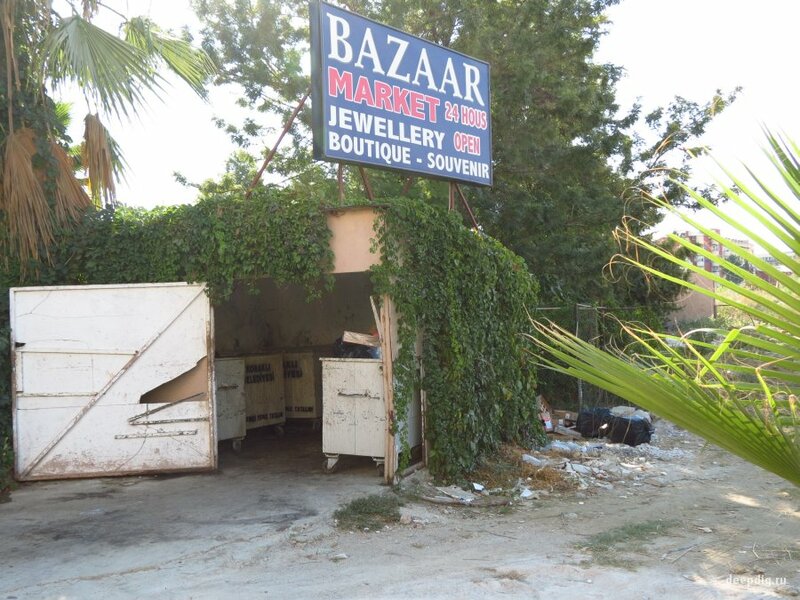 This peculiarity distinguishes it from the underground city of Kaymakl? (it will be discussed below) that is much wider in the horizontal plane. 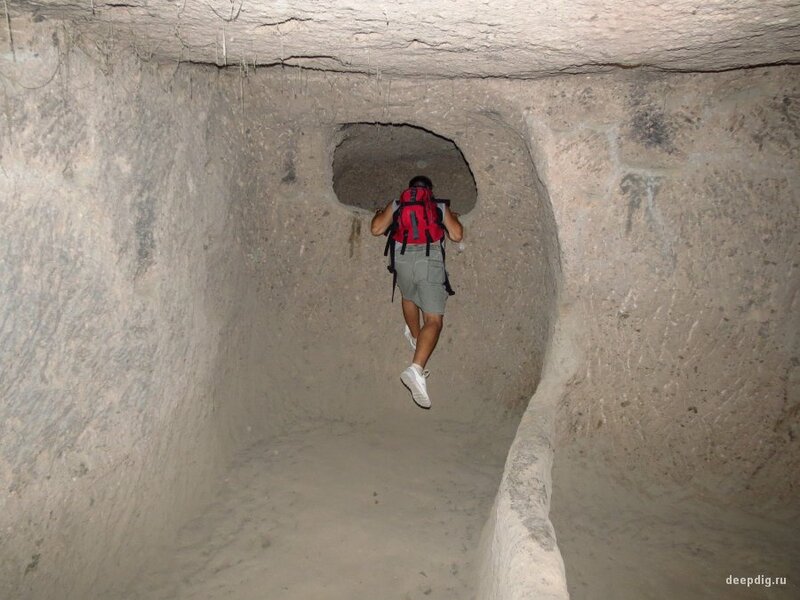 Kaymakli Underground city. 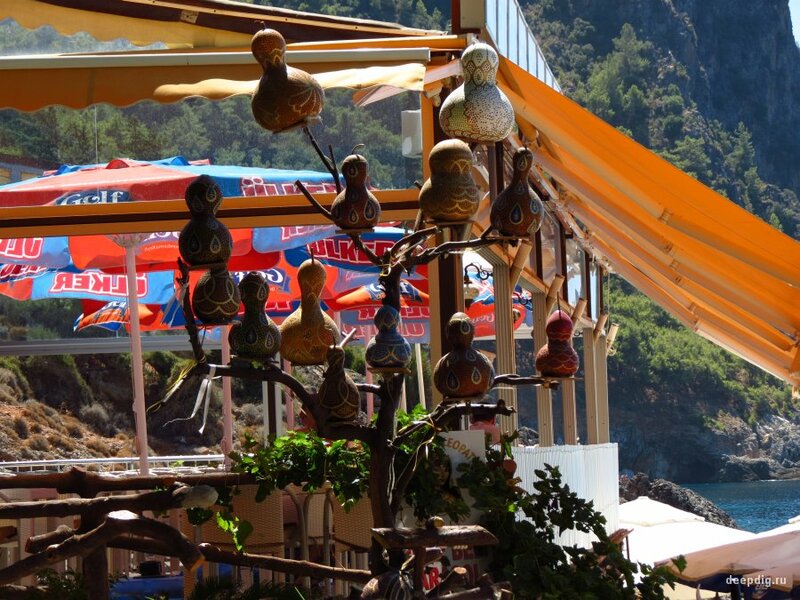 This place is located 10 km north from Derinkuyu and is also one of the favorite tourist destinations in the region. 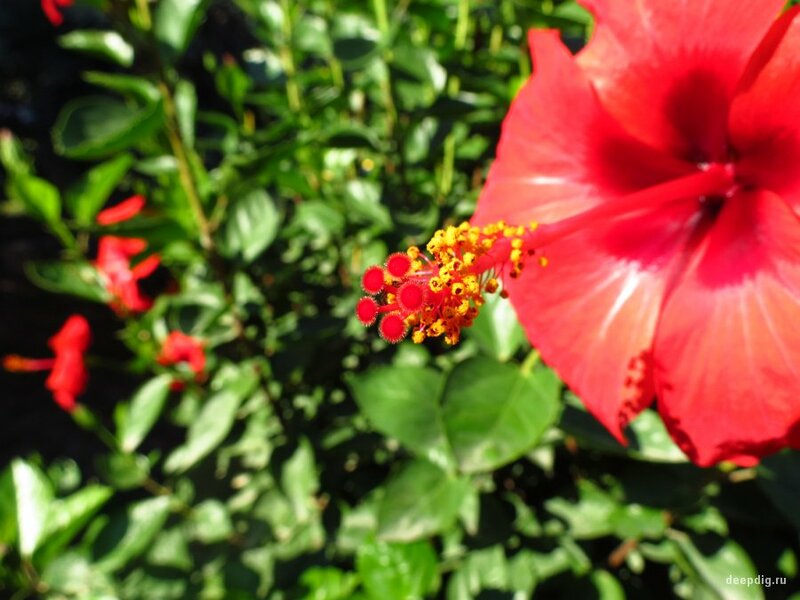 (Accordingly, it is also full of people and especially - of tourists from China and Japan ). 4 floors are available for visitors. From the bottom of them, if you look through the trunk of the ventilation shaft, you can see that it goes down another 10 m minimum. There is no explicit closed or blocked passes there. Hence the conclusion - or this shaft was also a well, or from some other place you can get into the deeper part of the city. 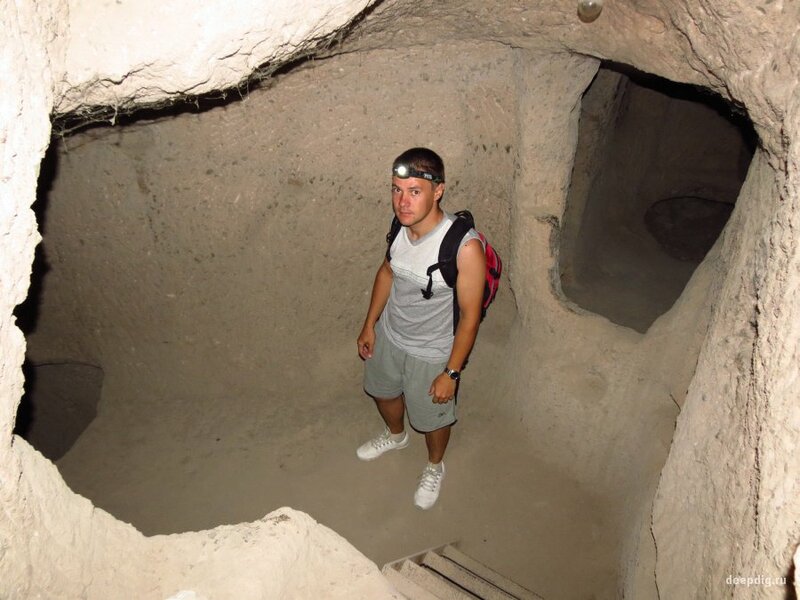 I want to note that, from the digger's point of view, Kaymakli is certainly more interesting than Derinkuyu. It is under UNESCO protection as well, but, firstly, here nobody told us a word about shooting with a tripod, and secondly (the most important), dark side branches of the main tourist pass are not so very carefully locked from all the curious tourists. Basically they close only passageways leading to the ventilation trunks to prevent that someone inadvertently flies to seek unexplored lower tiers. 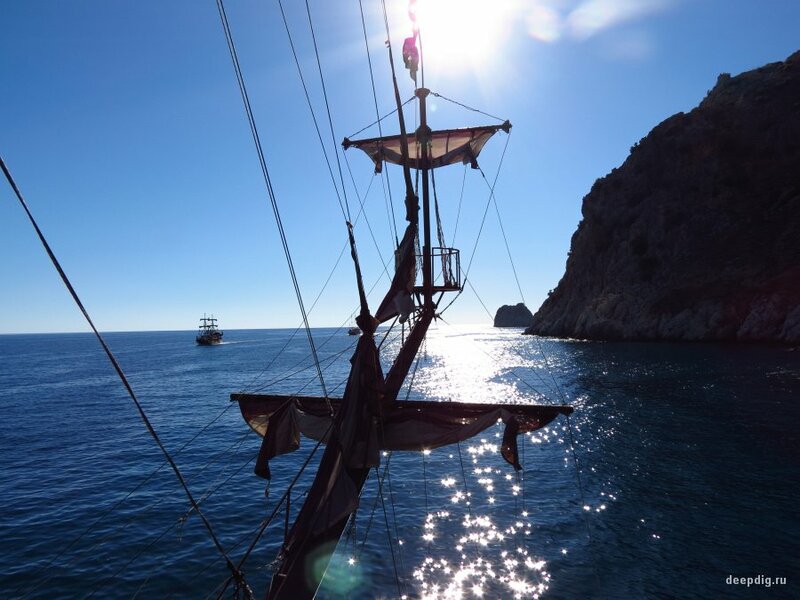 As for the rest – you are welcome, everything is open! 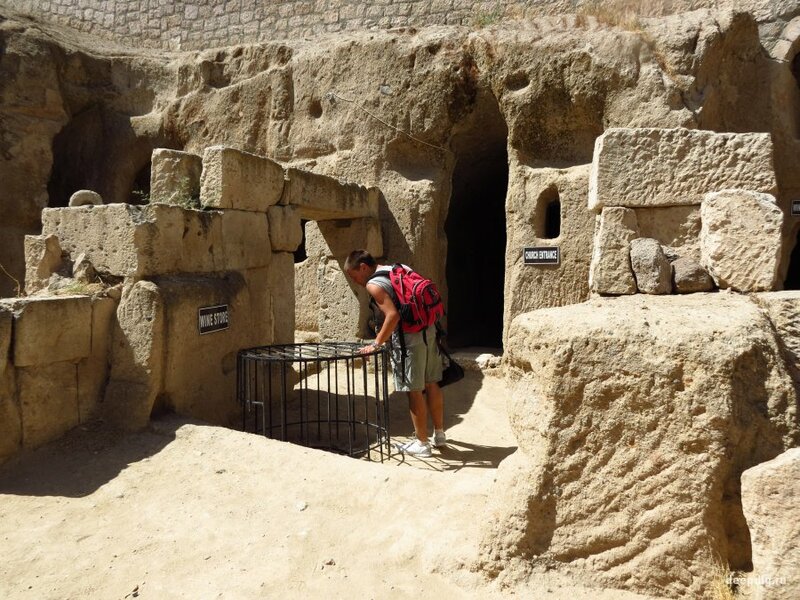 Perhaps, the administration did not have enough grids and locks for all passages, because, unlike Derinkuyu , this underground city is much more branched in breadth. 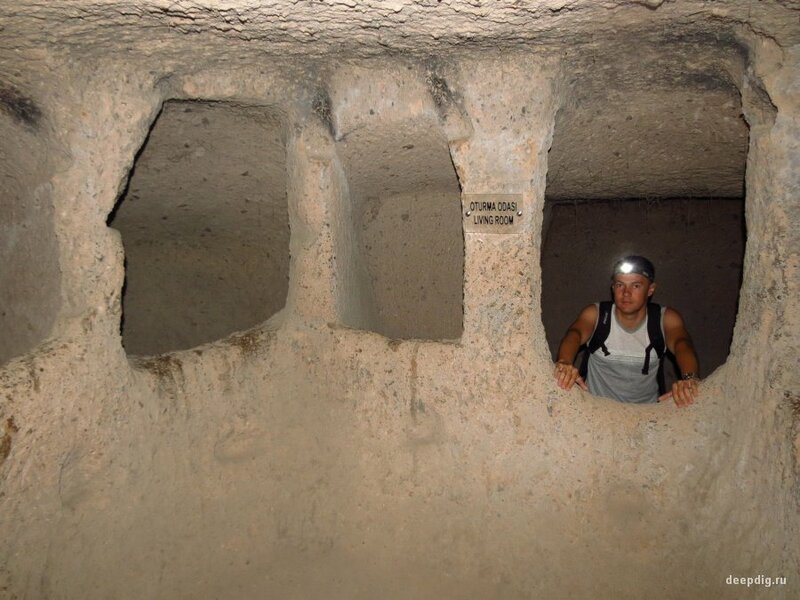 Of course, there is no lighting in that part of Kaymakli not prepared for tour groups. But could it stop, for example, us? Letting pass by another Japanese group, Scamp and I, we quickly quitted the marked tour route and came in a huge abandoned part of the city consisting of several layers. 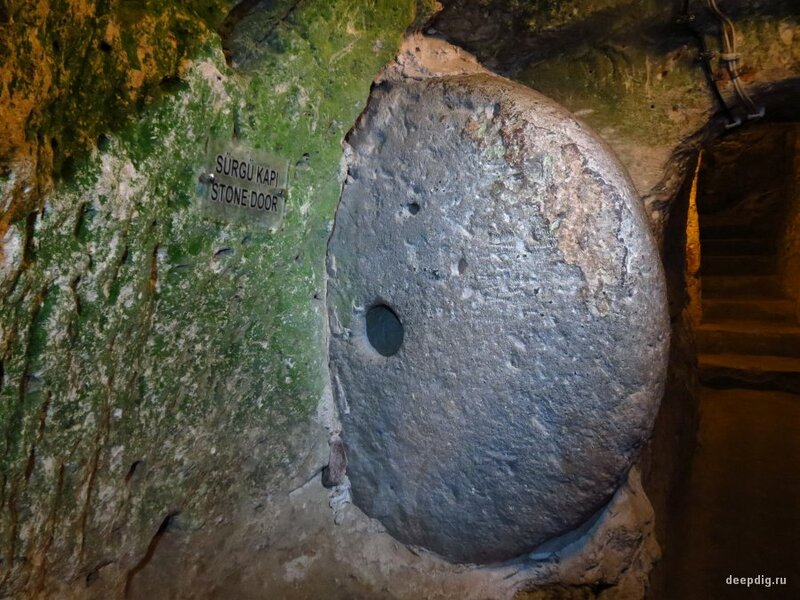 Along the way, we met several times open and half-open millstone doors. 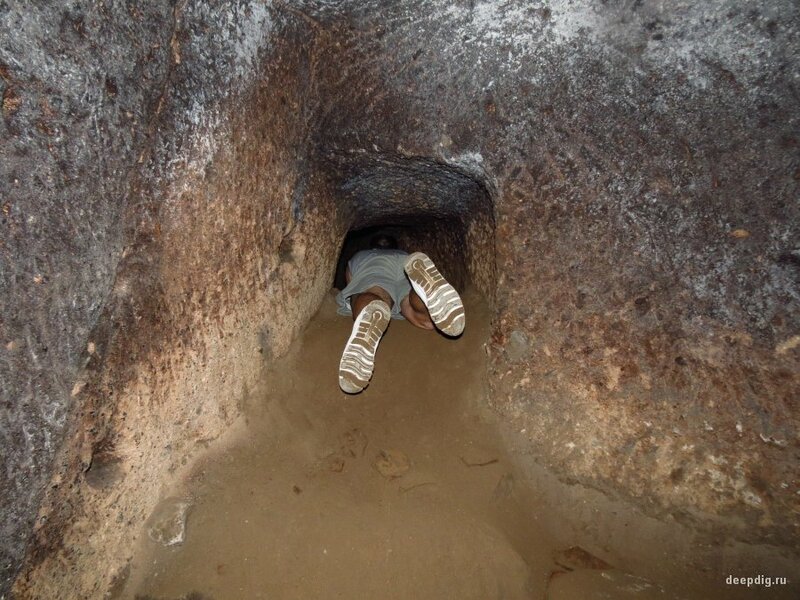 Sometimes we had to squeeze through them, taking off a backpack, a tripod and a camera carry case, so we were not afraid of prosecution - few would have dared to climb there. Somewhere we saw the bones of animals, somewhere - traces of water on the walls: apparently, in certain periods this part of the city could be flooded a little. 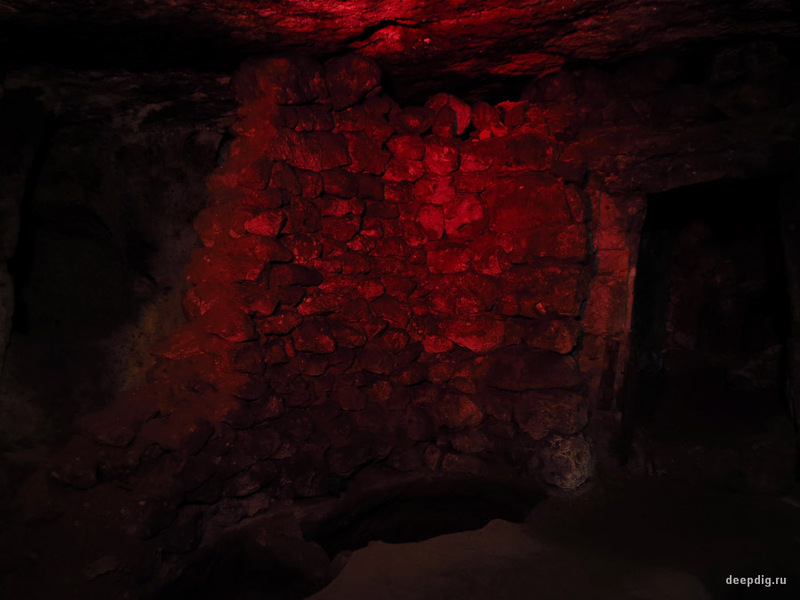 In an effort not to leave unexplored passages, we at the same time did everything possible not to get lost: walked according the right-hand rule, drew circles on the floor and put stones on them in the places where we just came out from. Still, once or twice orientation disappeared. 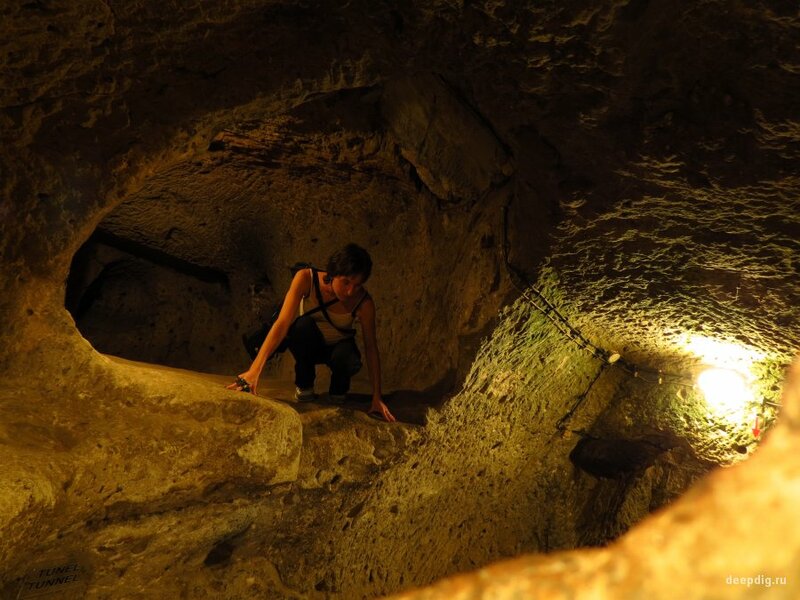 The closed part of the underground city of Kaymakli is like a cave labyrinth! Returning back on the tourist trail we have repeatedly looked into dark side branches. Here and there were just living rooms, here and there - narrowed passages turning into impenetrable fissures. In general, the work is waiting for local archaeologists. P.S. 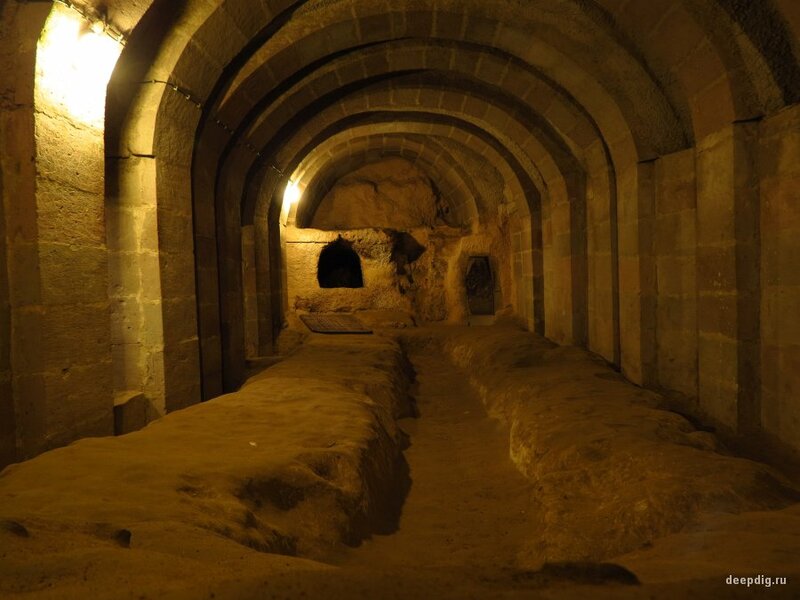 There is even a regional legend, how without it, talking that the two underground cities of Derinkuyu and Kaymakli are interconnected by a 10 - kilometer long tunnel! Who knows?.. But we, as always, will doubt until we see it firsthand. 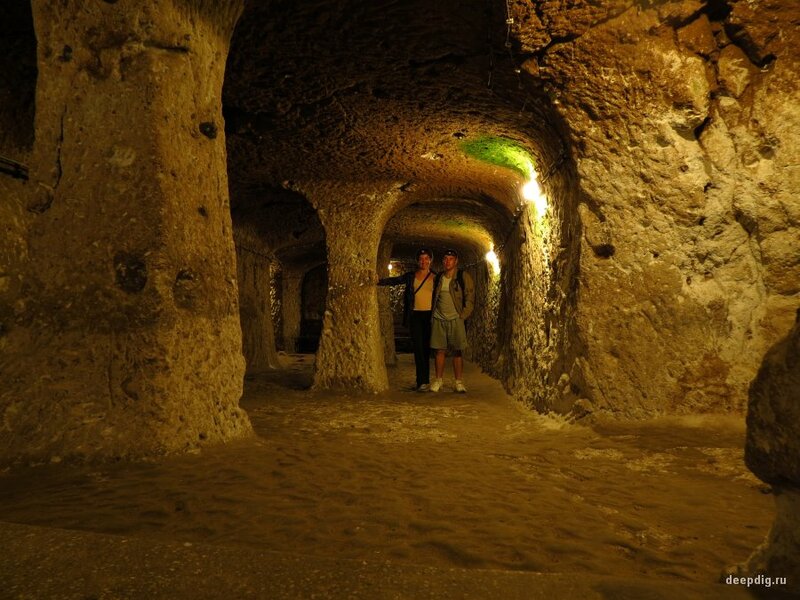 Gaziemir Underground city. 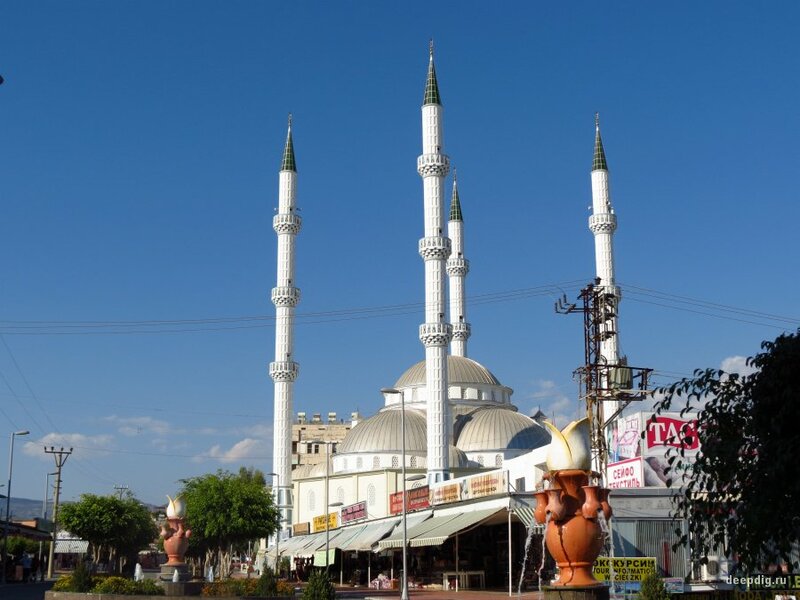 This is a location not far from the village of Guzelyurt . 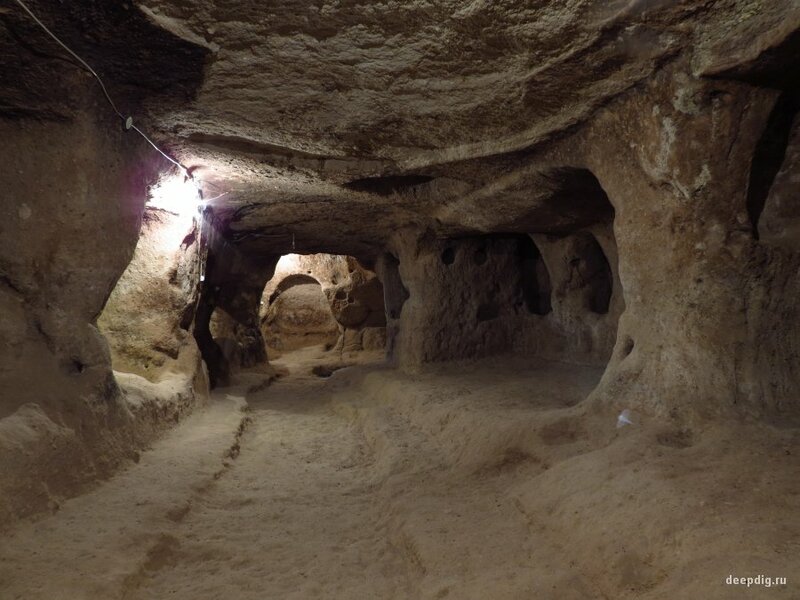 Underground city of Gaziemir was discovered by archaeologists and opened to the public very recently - in 2007. 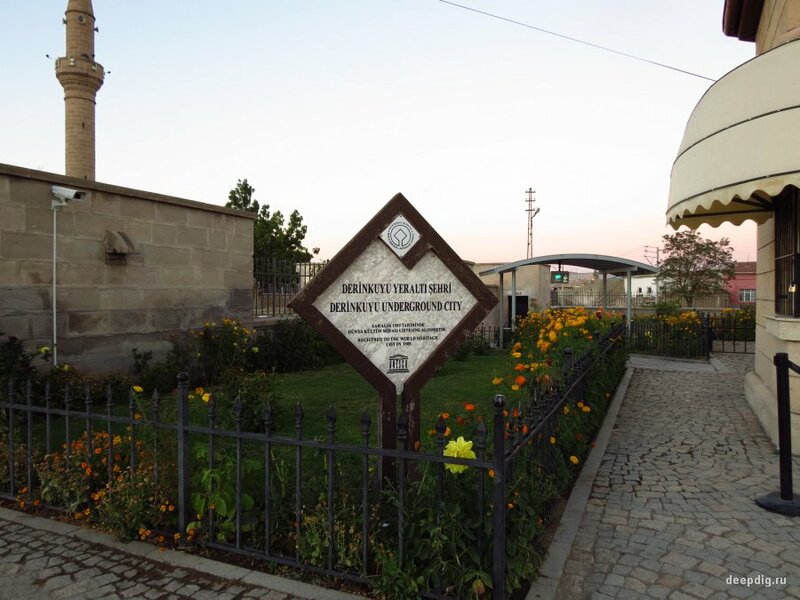 (Unlike described above Kaymakli and Derinkuyu investigated and opened to the public in the 60's). Apparently, Gaziemir is not yet included in the tour program of the majority of tour operators as, having arrived at midday, we didn't see any tourist bus on the Place. 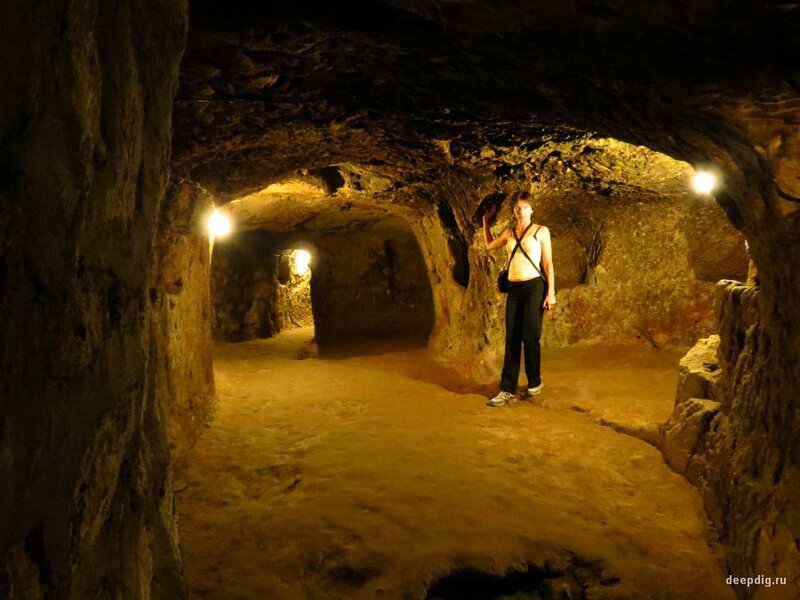 Due to its obscurity this underground city is very pleasant to all lovers of the underground shooting - you can easily take pictures with a tripod and spend as much time as you want on it. The internal plan of Gaziemir is very different from Derinkuyu and Kaymakli. First, it has fewer dimensions. 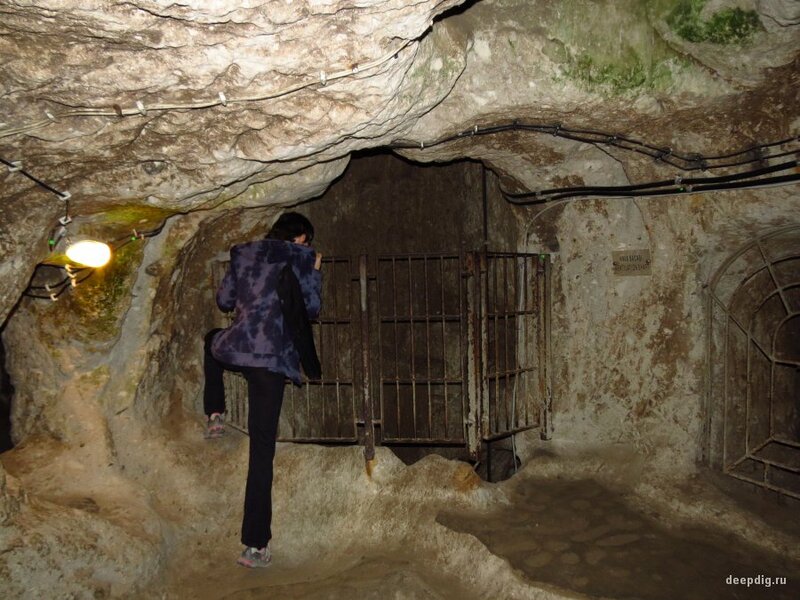 Second, the central hall is located on the surface, and from there you can get to all parts of the underground city located on the perimeter. Third, Gaziemir has very interesting large-scale rooms (everything here is of enormous size - the church, and the stables, and the byzantine kitchen, and the winery, and the warming room). 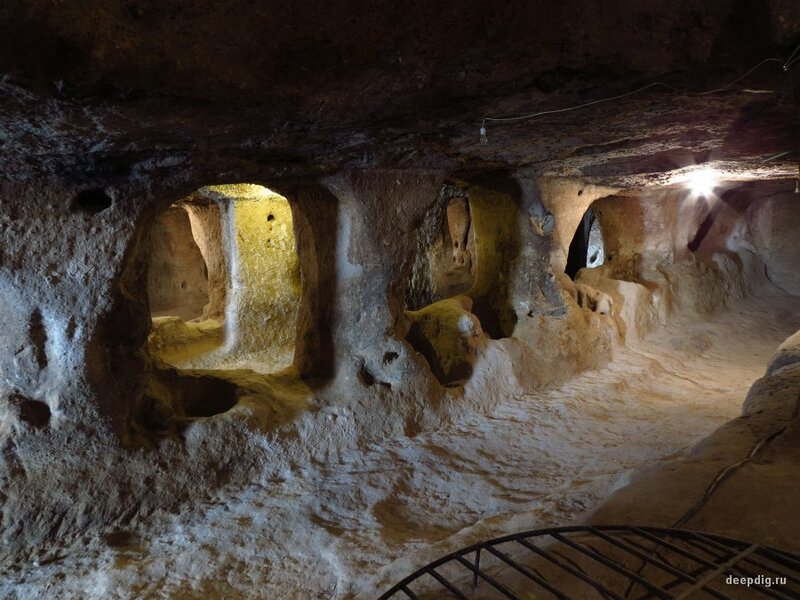 Fourth, this underground city has only one floor (all rooms are connected with each other in a horizontal plane; there are no ladders). 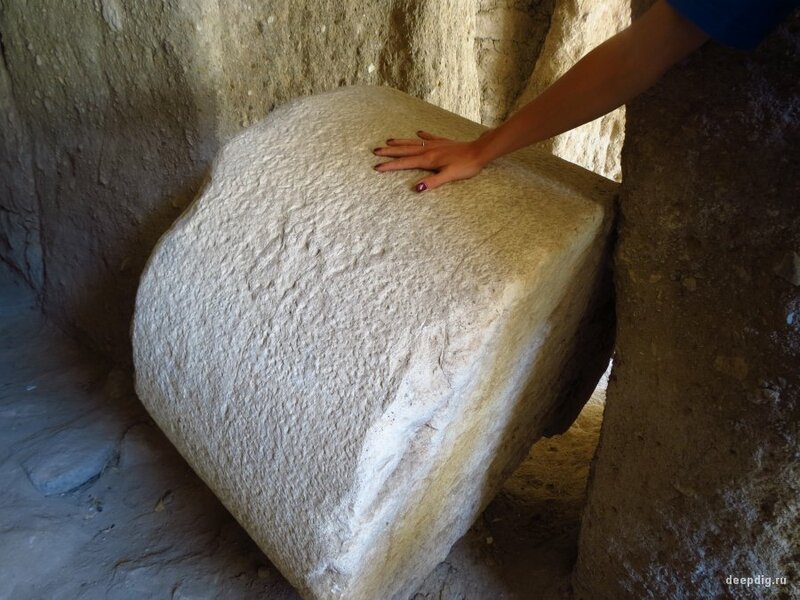 I'm certainly not an archaeologist but, looking at Gaziemir, I can confidently assume that some representatives of culture quite different from that which we encounter in Derinkuyyu and Kaymakli took part in Gaziemir's construction. And yet, of the differences - Gaziemir has a real prison cell. Apparently, for enemy prisoners. Cappadocia has made a lasting impression on us. 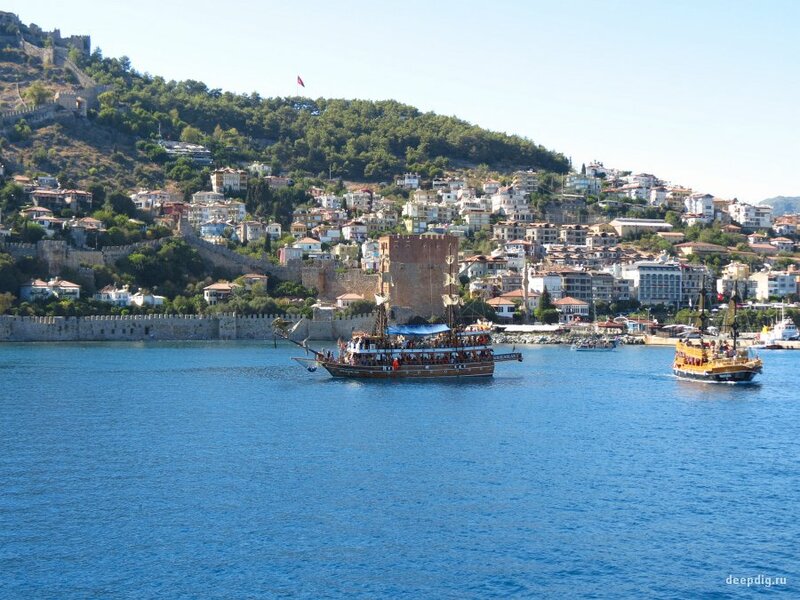 This ancient country deserves to fall in love with at first sight! 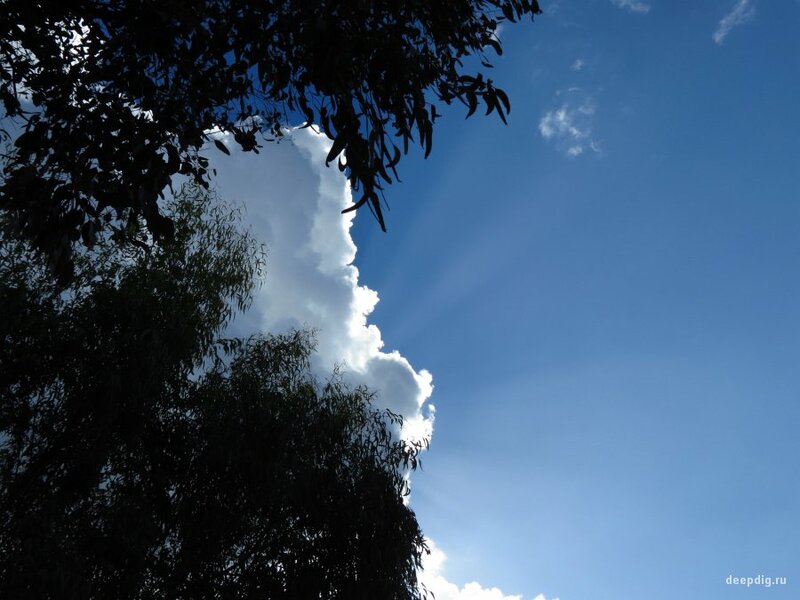 Here, everyone who comes could find something for himself: space volcanic landscapes, underground cities, rock fortress, beautiful hiking trails, ballooning at dawn, horse riding and quad biking, wonderful national cuisine, cozy small hotels (budget or top luxury). I hope we'll be able to get back here again!